It've been a while since my last updates. I have been busy with work, life. Planning to write a long post of my September trip to Jakarta with Emily to keep a record of our journey. And yes, its a busy month for me. 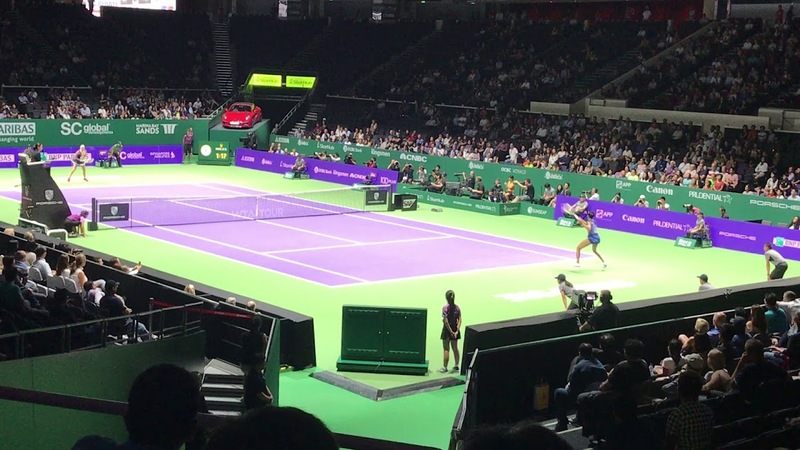 So let me share with you my recent experience in #WTAfinals. It is my very first tennis tournament and lucky me I got the free tickets and I get to witness Venus Williams vs Jeļena Ostapenko. I tried out tennis with friends and its not easy, you need to have good strength and the tennis ball is heavy too! I remembered hitting a tennis out of the court, luckily it didnt hit anyone car else it will be a huge cost i have to compensate. The match started at 7.30pm and we need to went through the security clearance and no food and drink allow. I love the lighting in the indoors stadium plus the full air conditioning made the match more enjoyable. Each tennis match is made up of two to three sets. To win a set, you must win at least six games. The games are scored starting at "love" (or zero) and go up to 40, but that's actually just four points. From love, the first point is 15, then 30, then 40, then game point, which wins the game. Well that's my experience over the night. P/S: I took an Uber and guess what the Uncle took a long way and ask me again for my address. He delayed my schedule home and gave me a bad rating. I cannot tahan so i report him. Luckily uber has their own system to refund extra miles he took else the driver can just take their own sweet time, making wrong turn to earn our money.